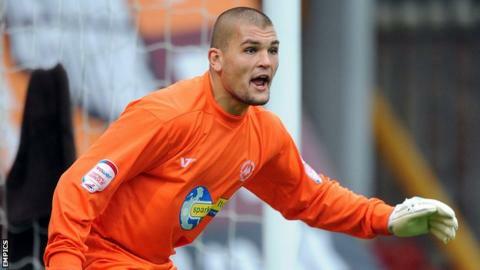 Peterborough keeper Bobby Olejnik says the team is fully behind manager Darren Ferguson despite their sorry start to the season. The team are bottom of the Championship following seven successive defeats. "Ironically, the more games we've lost, the closer we've grown," 25-year-old Olejnik told BBC Radio Cambridgeshire. "We have to get out of this together, there's no one individual that's going to do it. It's going to have to be collectively." Olejnik, who joined the club from Torquay over the summer for a fee thought to be around £300,000, added: "There's nothing we can do; it's just wasted energy if we look back at the games we've had. "We can analyse them, but don't look back and think 'what if, what if'. The Austrian experienced a similar losing streak during a spell in Scottish football with Falkirk and is drawing on that to try and help his team-mates keep their heads up. He said: "It's difficult not to be affected by it but players who have been through it are the ones who can help with their experience. "You think 'OK, we did this wrong, let's do this right this time' and that's really all we can do. "The younger lads just coming through need to take it in and learn from this as quickly as possible as well." Ferguson, the son of Manchester United boss Sir Alex, is in his second spell in charge at London Road and has insisted he has no intention of resigning, while he also retains the support of chairman Darragh MacAnthony.